Today, my two youngest children and I, was present during a most unusual dental extraction on a most unusual "pet". As you read, please remember that I write the truth, and nothing but the truth. The pet was a T-Rex, that wouldn't eat the "guts" that was given to him as a treat. Whilst there was also the offer of sausages, everyone agreed that a BARF diet (heart/guts) would perhaps be better for him. He was offered that, and he accepted it. Even so, he (T-Rex) "dropped his guts" on some poor children in the front row, and then rubbed his face on the ground, groaning softly. The poor T-Rex was in pain, and he let everyone know about it. He did it through a change in his behaviour, and a change in the way that he ate his food. What did his owner do? He (the owner) examined T-Rex's mouth, and identified a discoloured tooth that was a bit wobbly. Good on him! A braver man than I (well, I am a woman), but even so, braver person than I to wobble a tooth on a T-Rex. As it was my day off, I didn't offer to help out. They obviously had the situation under control, and it was a bit out of my comfort zone. Their "anaesthetic" was not one which I had any experience with, as they used two pre-schoolers on either side of T-Rex's strong hind legs to "hypnotise" him through long gentle strokes. We do know that nice long gentle strokes are calming in our dogs and cats, so I couldn't argue with this technique in terms of calming, but it is not a technique that I will adopt with my next man-eating patient. I did note though that there were no rapid movements either, and they were all very careful in ensuring that everyone knew the emergency position, in case the T-Rex "lost the plot" (aka got very angry). What was the emergency position? We were to use our forearms in front of our faces to "brace " ourselves, as we could live without our arms, but not our faces. Obviously, the OH & S officer was nowhere to be seen here, as I am sure that there were other safety precautions we would have needed to know about. As for my children and I, we stayed near the exit, just in case! What about the extraction of the tooth? With a pair of pliars, the owner grabbed the tooth and pulled it out. Amazing! T-Rex was a much happier boy afterwards, but I think he did get cranky when the patting of his hind legs stopped! Amazing! A happy T-Rex, a happy T-Rex owner, and obviously, all of us were happy too, as we still had our arms (and our faces) intact. I am sure you have guessed that everything I wrote from the second paragraph to now, obviously did not happen in a real live T-Rex Dinosaur. But I did not tell a lie - it did happen the way I described it. It was a show that I attended today with my two younger children at the Illawarra Fly Tree-top walk. 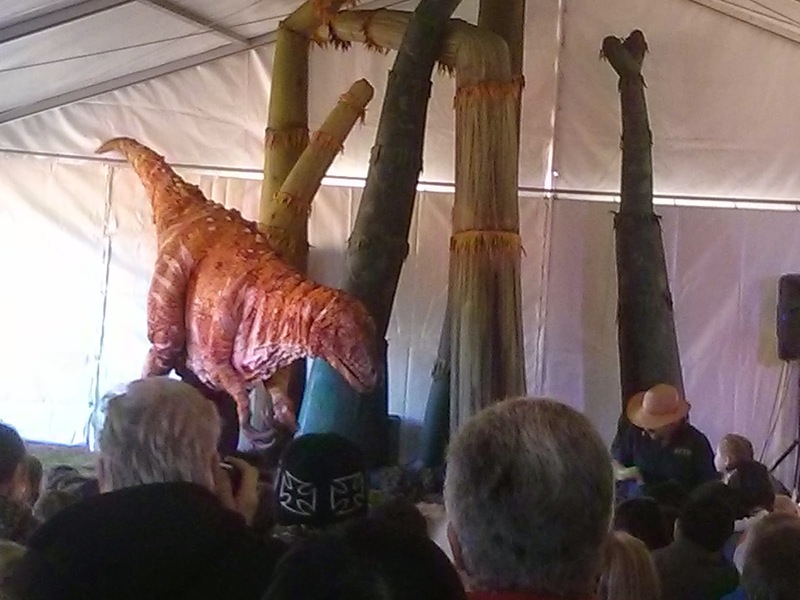 It was a show filled with giant dragonflies and an Aussie bred T-Rex with a sore tooth (and attitude to match). So what is my problem? Let's get serious for a minute (or two). I have been asked by pet owners to "extract" the wobbly tooth during a consultation. So I have no doubt that there are people out there who have done that to their pet, or worse, pet professionals, such as groomers or vet nurses who have done it in the past, and will continue to do it in the future. If any of you are reading this, whilst I understand the pressures that are placed on you to do it - just say no! For the welfare of our animals, just don't do it. No, this is not an Xray of the teeth of a T-Rex! It isn't possible to do any dental xrays, or a thorough dental examination on a pet that is awake. Flicking off tartar is NOT a "dental" nor is it enough if you are serious about your pet's oral health. Pet dental extractions aren't just wobbling the tooth and then pulling it out with some pliars. What vets do is a gentle, patient, undermining of the (very strong and tough) periodontal ligament, eventually removing the tooth, curetting the socket out, flushing it well, and then closing the socket over with fine sutures. We do this to stop ongoing pain with an open socket (and for many more reasons too). I won't get started on the nutritional aspects of T-Rex's diet, although I am sure they would normally eat more than the "guts" of its prey, and as such, perhaps, the sausages might have been more appropriate (being the combination of many parts of the animal, rather than a few organs only). What really stretched the "suspension of disbelief" for me was the obvious pain the T-Rex showed with respect to his sore tooth. Our dogs and cats rarely show signs of dental pain, so why would a T-Rex? It wouldn't, but it bothered me that the show perpetuated the myth that an animal will let others know that it is in pain, even to those that they love. Sadly, it isn't so. The signs that owners often do see if they are observant is the dropping of food or preferentially chewing on one side. But most owners are not able to see any signs of dental pain, as our pets just don't send out those signals. Our pets love us to much to complain. We should love them enough to get it checked out. This is why our dental checks are always free, all year round at Russell Vale Animal Clinic, as our pets do not tell us that they are in pain. We are happy to see all pets (unless they are a T-Rex). You are probably thinking that I am totally mad at this point. Well, I do sign off as the mad Dr Liz, so you wouldn't be wrong in thinking that too. I am mad, but more importantly, passionate about our animals, and their well being, even when I am not officially "working" as a vet. If you think that we can help you or your pet, then call us on 42 845 988 for an appointment. PS In case you didn't guess or thought I was writing fiction -The T-Rex (and other dinosaurs) were puppets, and we were at an amazing Dinosaur show at the Illawarra Fly Treetop Walk today - today was its final day there. 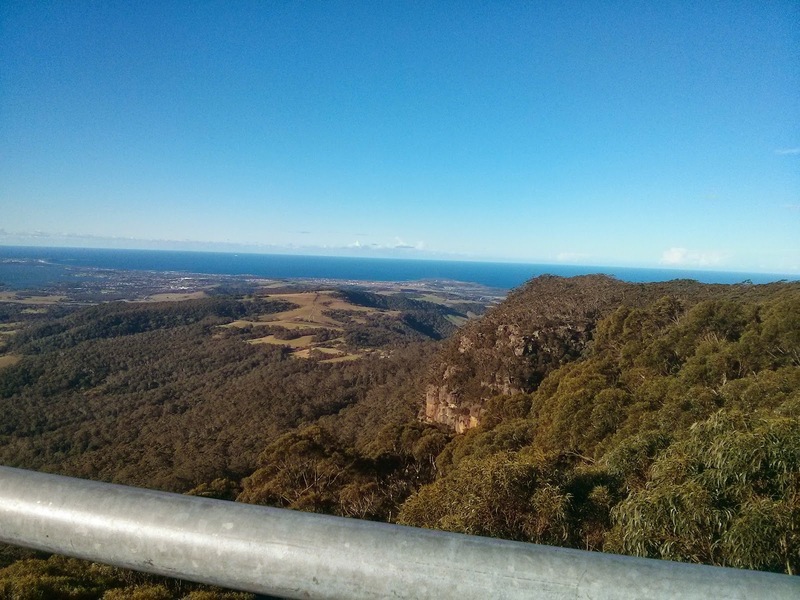 The view of the Illawarra from the Illawarra Fly.